Apparently there's a big football thing happening soon, and EA Sports is set to celebrate by introducing a World Cup Mode into FIFA 14 Ultimate Team. FIFA Ultimate Team World Cup is a completely separate mode, rather than being crammed into the existing FUT gameplay, which means you won't be able to import existing players or trade the World Cup squad members you collect. To take part, you choose your preferred nation from the 32-strong World Cup roster, and are given a starter pack containing players, a badge and kits. You can beef up your squad by purchasing special World Cup packs from the in-game store at a cost of 5000 coins or 100 FIFA Points. That's the same price as a Gold pack in normal Ultimate Team, and not coincidentally every World Cup pack comes with a Gold pack for the main game. In other words, whichever way you slice it, you're getting a nice freebie. It certainly sounds like a fun way to play along with the real tournament, and is a good excuse to expand your Ultimate Team collection at the same time. 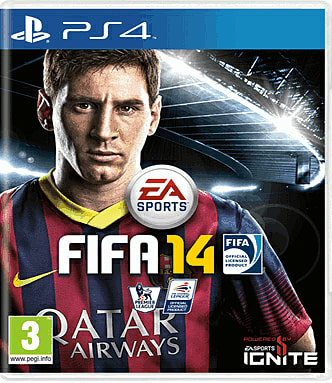 FIFA 14 is out now on all formats.